Economy | US Registries LLC. •The incoming monthly activity data suggest that GDP growth has slowed from 2.6% annualised in the fourth quarter to only around 1.5% in the first. At the same time, however, the business surveys have remained relatively upbeat, with a weighted average of the ISM activity surveys consistent with GDP growth accelerating above 4% annualised. (See Chart.) It’s clearly possible that growth picks up again in the second quarter. The rebound in consumer confidence suggests that consumption will continue to recover from the plunge in December, while a potential trade deal with China could give a temporary liftto exports. But with the fiscal boost having faded, and the continued slowdown in durables consumption and housing activity suggesting that higher interest rates are taking a heavier toll, a sustained recovery looks unlikely. We expect GDP growth to remain below its 2% potential pace this year, ruling out any further rate hikes from the Fed and ensuring that market expectations of rate cuts will continue to grow. The great American jobs machine is still roaring. Slowing global growth and trade friction may cloud the economic horizon, but U.S. small businesses in February went on an historic hiring binge. That’s according to the latest employment report from the National Federation of Independent Business, due out later today. NFIB also found a historic low in the percentage of business owners reducing employment—just 3% of survey respondents. “Owners are trying to hold on to the employees they have,” says Mr. Dunkelberg. Readers can be forgiven for thinking that the economy is headed back down to the slow-growth new normal of the past decade. That’s certainly the consensus in the media industry. But across all industries, the owners of small firms don’t seem to share that view. After the February hiring spree, the survey finds plans for future job creation remain robust and the main obstacle is not lack of business opportunities, but a lack of workers to take advantage of them. Fifty-seven percent reported hiring or trying to hire (up 1 point), but 49 percent (86 percent of those hiring or trying to hire) reported few or no qualified applicants for the positions they were trying to fill… Twenty-two percent of owners cited the difficulty of finding qualified workers as their Single Most Important Business Problem, only 3 points below the record high. Ten percent of owners find labor costs as their biggest problem, a record high for the 45-year survey. It may be a problem for owners but of course rising wages represent welcome news for workers. A net 31% of firms reported raising compensation in February—below January’s 36% surge but still historically strong. Small firms in the U.S. are reporting record job creation, higher wages and robust expansion plans. All of this may have U.S. workers raising a toast to the new abnormal. 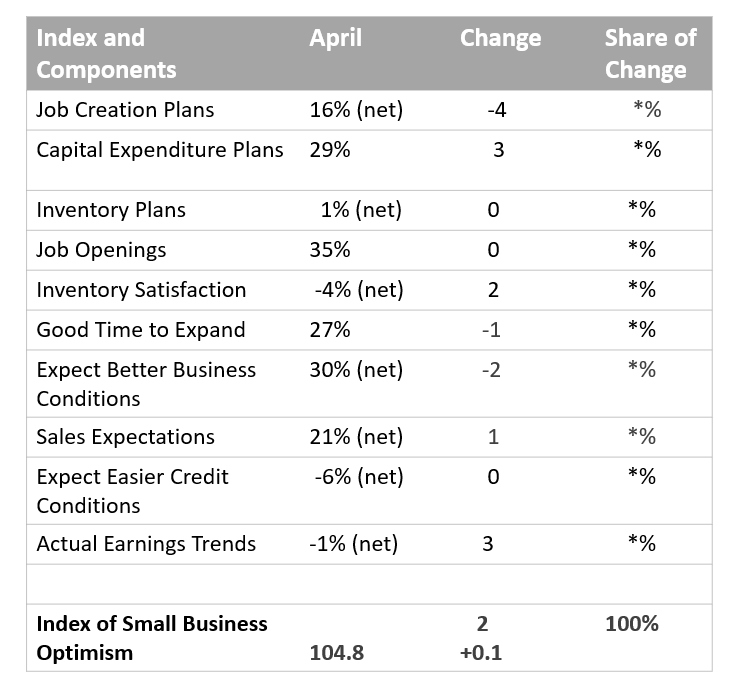 The NFIB Small Business Optimism Index remained basically unchanged in December, drifting down 0.4 points to 104.4, according to the report released today. Unfilled jobs and the lack of qualified applicants continue to be a primary driver, with job openings setting a record high and job creation plans strengthening. Reports of higher worker compensation remained near record levels and inventory investment plans surged. Expected real sales growth and expected business conditions in the next six months, however, accounted for the modest decline in the Index. Actual hiring strengthened to the highest reading in six months, job openings are at a record high levels, and plans to create new jobs are down only three points from August’s record high. The net percent of owners expecting better business conditions in six months and the percent viewing the current period as a good time to expand have both tapered off since the record high Index reading in August but still remain well above their historical averages. Actual capital outlays are five percentage points higher than in August, although plans for outlays are eight points below the high for this expansion. Plans to invest in inventories are only two points below August, the record high. Satisfaction with inventories is two points better. Last week’s NFIB Jobs Report noted that job creation remained solid with a net addition of 0.25 workers per firm, up from 0.19 in November and the best reading since July. A seasonally-adjusted net 23 percent plan to create new jobs, up one point from November’s reading. Not seasonally adjusted, 23 percent plan to increase total employment at their firm (up one point), and five percent plan reductions (down two points). A record 39 percent of small business owners reported job openings they could not fill in the current period. Sixty percent of owners reported hiring or trying to hire, but 90 percent of those reported few or no qualified applicants for the position. Twenty-three percent of owners cited the difficulty in finding qualified workers as their Single Most Important Business Problem. The percent of business owners reporting that they increased employee compensation continued at 45-year record high levels. In December, a net 35 percent reported increasing compensation and a net 24 percent reported planned increases in the next few months. The net percent of owners reporting inventory increases fell three points to a net three percent (seasonally adjusted), following November’s strong showing, the second-best since 2005. A net four percent of all owners (seasonally adjusted) reported higher nominal sales in the past three months, down five points from very strong readings. The net percent reporting higher sales averaged two percent in 2017 but nine percent in 2018, with a peak value of 15 percent. The net percent of owners expecting higher real sales volumes fell one point to a net 23 percent of owners. 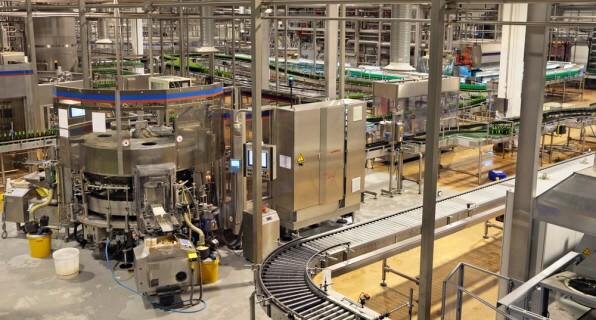 Consumer spending has remained steady and small manufacturing and construction firms cannot find enough employees to fill their open positions, selling all they can produce without more workers. Unchanged from last month, 61 percent of owners reported capital outlays. Of those making expenditures, 42 percent reported buying new equipment, 25 percent acquired vehicles, and 15 percent improved or expanded facilities. Six percent acquired new buildings or land for expansion and 15 percent spend money for new fixtures and furniture. Thirty-two percent of owners reported all credit needs met (unchanged), and 50 percent said they were not interested in a loan, up three points. By comparison, only three percent reported financing was their top business problem (up one point), while 13 percent cited taxes (down six points), 14 percent citing regulations and red tape, and 23 percent the availability of qualified labor. 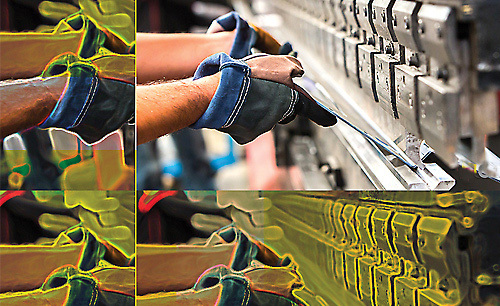 While big numbers of retirees or soon-to-be retirees are helping drive the call for a new influx of manufacturing workers, they aren’t the only reason for the urgency. U.S. manufacturers continue to announce expansions or new builds across the country and that growth means more workforce needs. Here is a look at where some of that manufacturing building growth is occurring. The widely trumpeted growth surge in U.S. manufacturing is showing up in both new and expanded manufacturing facilities across the nation. Some factories have opened, others have been announced and even more are still raising the roof or extending their walls. Embargoed Tuesday, May 8 at 6 a.m. 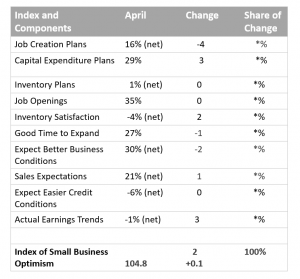 The Index of Small Business Optimism increased slightly in April to 104.8, a gain of 0.1 points. The Index has been higher only 20 times out of the last 433 surveys. Labor quality remained the #1 problem for the fourth straight month. Reports of improved earnings trends were the highest in survey history. Reported job creation posted another solid gain. Hiring plans remained strong, as did reports of actual net increases in employment over the past few months. 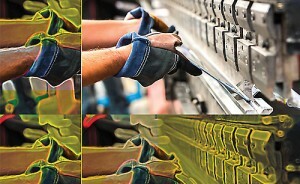 Reports of labor quality as a top business problem remained at record levels. Reports of capital outlays rebounded to strong levels after a minor decline in March. There appears to be more interest in credit to support spending, but not strong. Cash flows from solid profit trends and tax cuts are supporting higher spending and hiring without debt, boosting this recovery to the second longest expansion in history. Reports of employment gains remain strong among small businesses, inconsistent with the BLS report for March employment gains. The increase in new business establishments is running well ahead of eliminations, a real boost to new employment. Owners reported adding a net 0.28 workers per firm on average, the third highest reading since 2006 (down from 0.36 workers reported last month, the highest since 2006). Sixteen percent (up 2 points) reported increasing employment an average of 2.7 workers per firm and 9 percent (unchanged) reported reducing employment an average of 2.5 workers per firm (seasonally adjusted). Fifty-seven percent reported hiring or trying to hire (up 4 points), but 50 percent (88 percent of those hiring or trying to hire) reported few or no qualified applicants for the positions they were trying to fill. Twenty-two percent of owners cited the difficulty of finding qualified workers as their Single Most Important Business Problem (up 1 point), exceeding the percentage citing taxes or regulations. Shortages of qualified workers are clearly holding back economic growth. Thirty-five percent of all owners reported job openings they could not fill in the current period, unchanged and tied with March 2018, July and October 2017 for the highest reading since November 2000. Twelve percent reported using temporary workers, up 2 points. Reports of job openings were most frequent in construction (48 percent) and manufacturing (48 percent). The inability of construction firms to organize teams is slowing the construction of new homes at all levels. A seasonally-adjusted net 16 percent plan to create new jobs, down 4 points from March but historically strong. Not seasonally adjusted, 27 percent plan to increase total employment at their firm (down 3 points), and 3 percent plan reductions (up 1 point). In some industries, nearly half the firms have unfilled openings, especially severe in construction and manufacturing. Labor markets are very tight, for both skilled and unskilled workers. The strong demand indicated by the NFIB data anticipates an unemployment rate below 4 percent. Expected real sales volumes and reports of positive sales trends were very good and growth has been solid, leaving labor demand historically very strong. Sixty-one percent reported capital outlays, up 3 points. Of those making expenditures, 43 percent reported spending on new equipment (up 4 points), 27 percent acquired vehicles (up 3 points), and 16 percent improved or expanded facilities (unchanged). Five percent acquired new buildings or land for expansion (down 3 points) and 15 percent spent money for new fixtures and furniture (up 3 points). Non-residential fixed investment has grown at a better than 6 percent rate for the past 5 quarters (compared to under 1 percent in 2015 and 2016) and small business has made a major contribution. 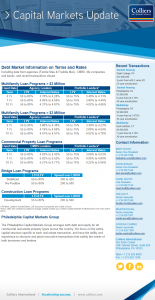 Twenty-nine percent plan capital outlays in the next few months, up 3 points. Plans were most frequent in manufacturing (38 percent) where additional capacity and productivity-enhancing investments are needed and construction (32 percent) where labor-saving investments are needed to increase the number of housing starts and completions. Hiring difficulties will lead firms to engage in more training and adopt more labor saving technology to support growth and serve growing numbers of customers. A net 8 percent of all owners (seasonally adjusted) reported higher nominal sales in the past three months compared to the prior three months, unchanged and the fifth consecutive strong month. After a blow-out holiday season, consumer spending slowed in the first quarter according to the Bureau of Economic Analysis, contributing to a weaker first quarter GDP number. On Main Street, there was no slowdown in reports of improving sales trends. Customers (consumers and other businesses) turned out in numbers that rivaled performances turned in all year and March data indicated that the consumer is back, which will boost the second estimate of first quarter growth. The net percent of owners expecting higher real sales volumes rose 1 point to a net 21 percent of owners. 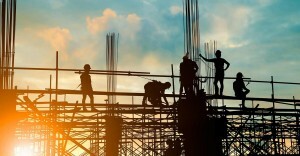 Fifty-nine percent of construction firms and 56 percent of manufacturing firms expect higher real sales volumes in the coming months. Wages and salaries grew by about $3,000 per family last year (about 40 percent better than 2016) and will be boosted by the tax cuts this year. Consumer sentiment has remained solid, anticipating continued good spending in the coming months. The net percent of owners reporting inventory increases rose 1 percentage point to a net 4 percent (seasonally adjusted), positive and extending a four month run of substantial inventory building (a boost to GDP growth). The net percent of owners viewing current inventory stocks as “too low” (a positive number means more think stocks are too low than too high, a positive for inventory building) improved 2 points to a negative 4 percent. The build in inventory is clearly not excessive in the minds of owners expecting continued strong sales. The net percent of owners planning to build inventories was unchanged at 1 percent, the eighteenth positive reading in the past 19 months. This has been very supportive of GDP growth over that period. The net percent of owners raising average selling prices fell 2 points to a net 14 percent seasonally adjusted, breaking a steady march to higher levels that started in November of 2016. The Federal Reserve’s target of 2 percent inflation (based on the headline Personal Consumption Deflator) has not been reached, but it is close. But, if Main Street slows the frequency of its price hikes, reaching the goal will become more difficult. Unadjusted, 9 percent of owners reported reducing their average selling prices in the past three months (up 1 point), and 26 percent reported price increases (unchanged). Seasonally adjusted, a net 22 percent plan price hikes (down 3 points). With reports of increased compensation running high, there is more pressure to pass these costs on in higher selling prices, although tax cuts and growing operating profits alleviate some of this pressure. Still, as the gap between the percent raising compensation and raising prices closes, more of these costs will be passed on to customers. The NFIB data predict a PCE inflation rate of 2.1 percent in the months ahead. Reports of higher worker compensation were unchanged at a net 33 percent, the highest reading since 2000. Although government reports of wage and salary gains remain historically low, they are the best in a long time, and don’t include benefits. Historically wage gains were larger, but that was in environments with much higher inflation. Plans to raise compensation rose 2 points to a net 21 percent, but below its recent peak of 24 percent in January. Owners complain at record rates of labor quality issues, with 88 percent of those hiring or trying to hire reporting few or no qualified applicants for their open positions. Twenty-two percent (up 1 point) selected “finding qualified labor” as their top business problem, more than cited taxes, weak sales, or the cost of regulations as their top challenge. The frequency of reports of positive profit trends improved 3 percentage point to a net negative 1 percent reporting quarter on quarter profit improvements, the best reading in the survey’s 45 year history. Although the new tax law will impact profits this year, much of the current improvement is due to gains in operating profits and stronger sales. Sales gains from stronger growth fall to the bottom line before costs such as rising labor costs catch up. Overall, the new tax law and the strong economy are very supportive of profit improvements. Four percent of owners reported that all their borrowing needs were not satisfied, unchanged and historically low. Thirty-two percent reported all credit needs met (up 1 point) and 50 percent said they were not interested in a loan, up 3 points but one of the lowest readings since 2010. Only 2 percent reported that financing was their top business problem compared to 18 percent citing taxes, 13 percent citing regulations and red tape, and 22 percent the availability of qualified labor. Weak sales garnered 8 percent of the vote, down 3 points and only 3 points above the 45 year record low reading. Five percent reported loans “harder to get”, historically low. In short, credit availability and cost are not issues and haven’t been for many years, even with the Federal Reserve raising interest rates. Thirty-one percent of all owners reported borrowing on a regular basis (down 1 point). The average rate paid on short maturity loans was up 30 basis points at 6.4 percent, rates are rising gradually with Fed policy moves. 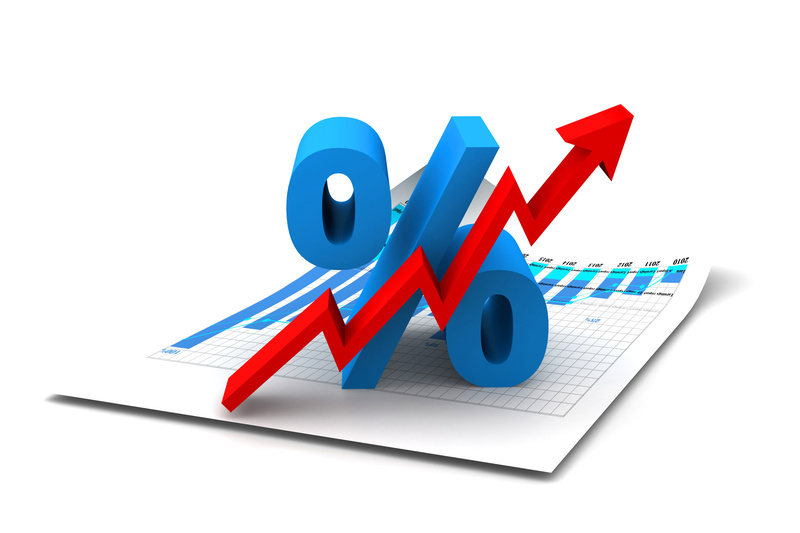 In anticipation of the Federal Reserve rate hikes, borrowers have increased their demand for fixed rate loans with longer maturities. As the Federal Reserve moves away from its focus on keeping rates low, more firms are reporting changes in the interest rates they pay. For those experiencing a rate increase, not a happy event, but not an impediment to borrowers who now see much higher rates of return on investments in a growing economy with lower tax rates. Bigger picture, it is important to be returning the job of capital allocation to markets and interest rates, and not Federal Reserve policy. We have twice experienced in recent times the cost of interest rate suppression, “too low for too long”. GDP growth for the first quarter came in at 2.3 percent, considerably shy of the 2.9 percent “guess” by the New York Federal Reserve but well above the Atlanta Fed’s 2 percent “guess.” Most observers feel the economy was much stronger in the first quarter of 2018, although consumers did slow spending considerably in January and February after their holiday binge. March has come in better, and that will show up in the second “guess”. After the cold weather pause, it appears consumer spending is back on track. Business invesment grew just above a 6 percent rate, 1.5 points faster than the average in this recovery. Small business capital spending has picked up the pace. GDP growth for the first quarter will likely be revised up at the next “guess,” as consumers were back spending in March and exports grew substantially while imports (a negative for GDP arithmetic) slowed. Federal Reserve policy now revolves around two issues. First, will inflation finally hit the Federal Reserve’s 2 percent target? Second, will they raise rates even faster if economic growth runs at 3 percent or better (as even the CBO forecasts) and inflation starts to pick up? Removing the “punch bowl” just when the party is really hopping is a habit (and responsibility) of the Fed. Currently the Fed plans two more rate hikes this year, but if inflation finally starts to run, more are possible – unless the Fed decides to let the economy “run hot” with more inflation. Inflation pressures on Main Street remain “moderate” and indeed fell back a bit in April. Overall, the outlook remains very positive. Forecasters have the growth pace near 3 percent, even with the weak start in the first quarter (which will likely be revised up). The main impediment to growth will be the short supply of labor, which plagues all industries but especially manufacturing and housing. House prices are rising sharply but are not directly included in the inflation measures. Housing starts are still running below the estimated 1.5 million needed based on demographics. This pressure will show up in rents and ultimately in the PCE inflation measure. That said, 2018 will be a “happy new year”. employment. These figures are seasonally adjusted unless noted. The graphs show quarterly data (first survey month in each quarter), updated when available by subsequent monthly surveys. 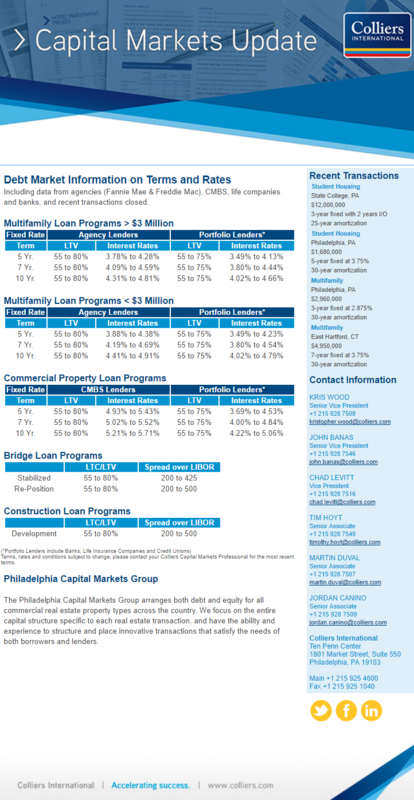 Including data from agencies (Fannie Mae & Freddie Mac), CMBS, life companies and banks, and recent transactions closed.